Man leaps from upstairs window in Larne "burglary"
A man has been arrested following a reported aggravated burglary in Larne, County Antrim, in which the occupant of a flat leapt from an upstairs window. Six masked men armed with bats and iron bars forced entry to the property in the Ballycraigy Ring area of the town at around 7.30pm on Saturday. The male occupant was assaulted and injured before he jumped out of the window. He suffered a suspected broken leg. A car parked outside the property was extensively damaged by the masked men. Detectives investigating the attack have confirmed that a 34-year-old man has been arrested in connection with the incident and remains in custody. Sinn Fein councillor for the area James McKeown said such incidents were not uncommon in Larne. "There have been a number of these incidents over the last number of years," he said. "I would call on the police in Larne to set up a specialist task force to deal with this type of crime." 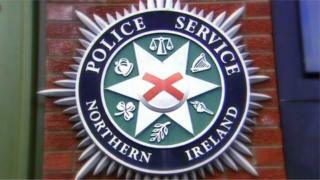 The PSNI appealed for help from anyone who can assist with their enquiries.